Every year when it comes time to take the photo for the Christmas card, I sort of dread it. Whether I take the photo myself or hire someone to do photos of the entire family, I know that it will be frustrating for me. 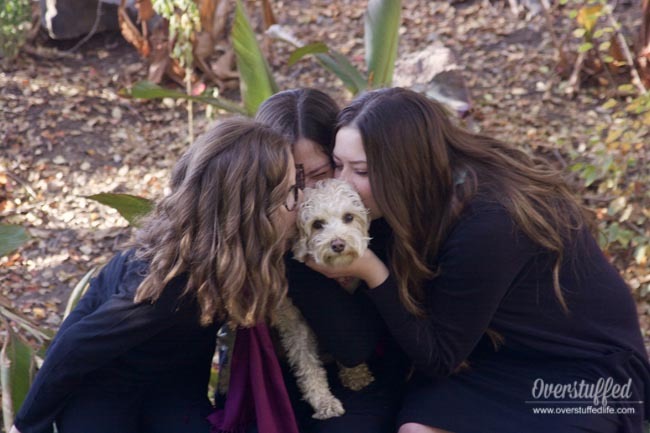 I don't know why it has to be so difficult to get everyone to cooperate at the same time during photoshoots, but it is a fact of life, as every mom knows. One of my very favorite things about Christmas is sending and receiving Christmas cards, so I just have to work through my frustration and anxiety about getting the perfect photo and remember that the end result is always worth it. 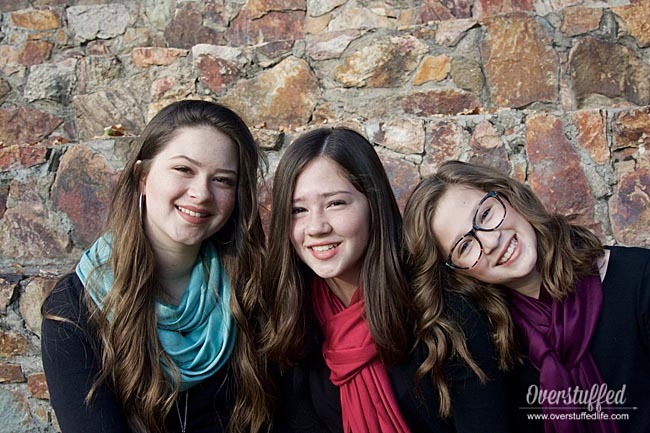 I've been taking the photos and designing my own Christmas cards since my girls were teeny-tiny, so I've learned a lot about how to get the "perfect" photo of them. Whether you're going to take the photo yourself or you're hiring someone else to do it, these tips will help you get a photo of your family that you'll truly treasure. When my girls were younger, I always did matching Christmas and Easter dresses. It's just one of those things that moms of all girls often do—and it brought me great joy to do it. I think having them in matching dresses in our Christmas cards always looked wonderful, and if The Maestro and I were also in the photo, we would try to coordinate the colors we were wearing with their dresses. 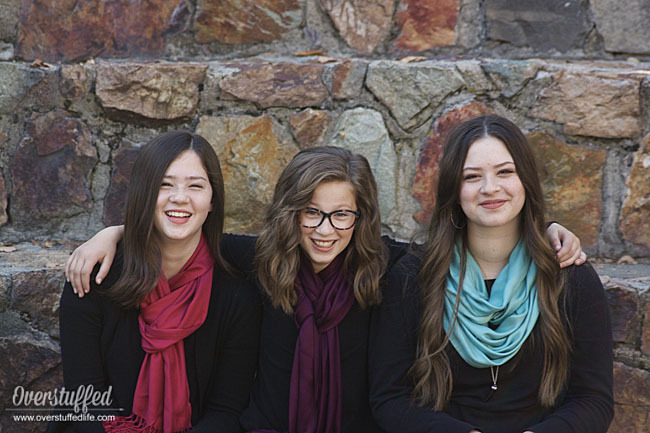 Now that my two eldest daughters are teenagers, they wouldn't be caught dead dressing exactly alike. 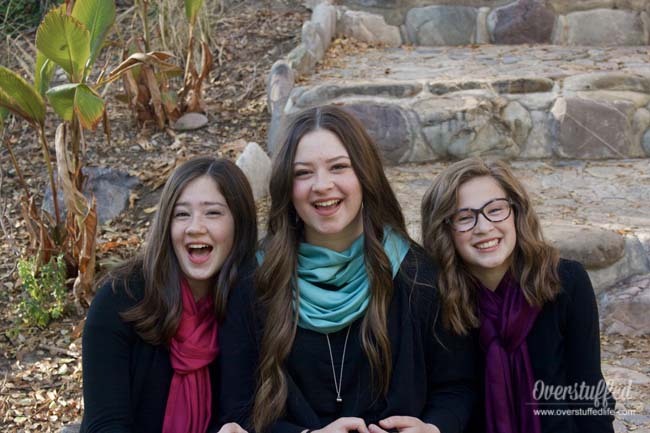 And while I still buy them new dresses for Christmas, their Christmas dresses haven't been featured in the last several Christmas cards because they didn't coordinate and therefore wouldn't photograph as well. For photos to look their best, you have to coordinate both color and style. Coordinating style just means that you don't want Dad wearing a suit while the kids are in jeans. Either everyone dresses up in Sunday best or everyone wears a more casual look. Similarly, you don't want one person in shorts while everyone else is wearing pants. Think cohesive in style and you'll be just fine. You'll want to avoid styles that include a lot of patterns or big logos, as those will detract from your photos, even if the clothes look great on your kids. I also recommend staying away from the whole white + denim look because it is difficult to photograph it well. Choose a color scheme such as red/white/blue or yellow/grey/denim and build everyone's outfits around those colors. The great thing is that the colors don't have to match exactly—in fact, they shouldn't. At our house, we all try to dress our truth—which is a wonderful energy profiling system that helps each of us to dress according to our own Energy Types and personal styles. 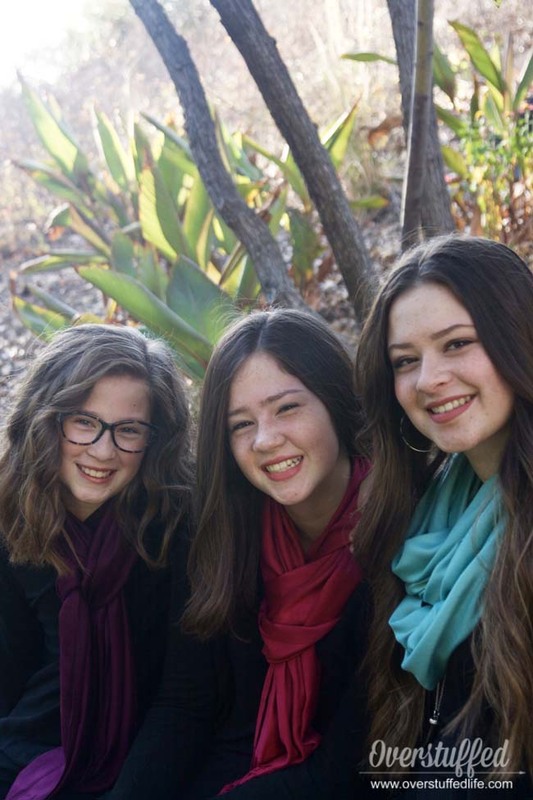 In the Dressing Your Truth system there are four Energy Types, and wouldn't you know it—each of my daughters is a different type. This means that the color palettes each of them wear are different, but it doesn't mean they can't wear the same colors. If we choose a color scheme for photos that includes blue, they will each wear their Energy Type's version of blue and it will still look fabulous and cohesive. 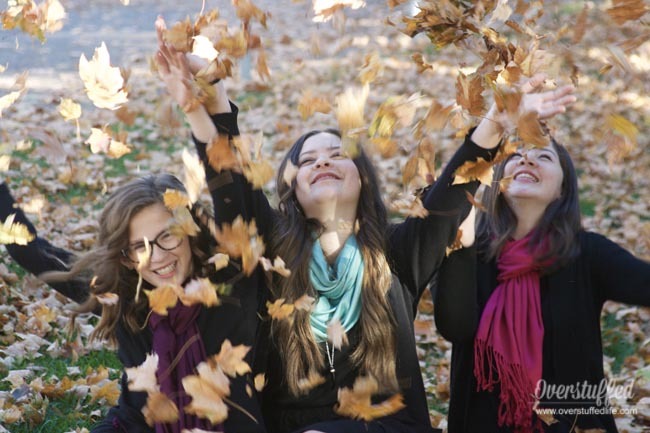 This year, we coordinated the style by having them each wear scarves. 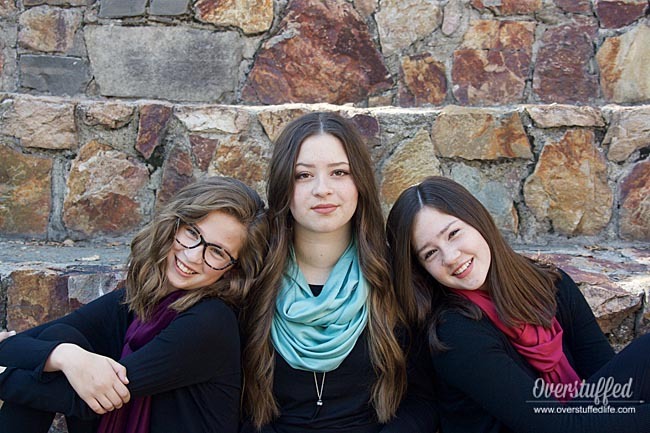 The scarves were coordinated to match the colors of the Christmas card design I had originally picked out (funny enough, I changed my mind once I finished the photoshoot) and I made sure that each girl had a color that was within her type palette. The photos turned out beautifully! I am a huge fan of doing the Christmas card photos outdoors if at all possible. Do some scouting around your area to find places that have beautiful and interesting landscapes or backdrops for your photos. We live on Lake Superior, so I have done our photos on the lake a few times. I also enjoy some of the mine ruins that are in our town—they provide a really cool feel for our photos. This year, we are living in Utah while The Maestro is on sabbatical, so I took them to the American Fork amphitheater. It's a super popular place for photographers because it has such cool and varied backdrops. In fact, while we were there taking photos last Sunday there were probably 10 other families doing their Christmas card pictures. It was fun to see how other families had coordinated their clothing and the poses and backdrops they chose for their pictures. 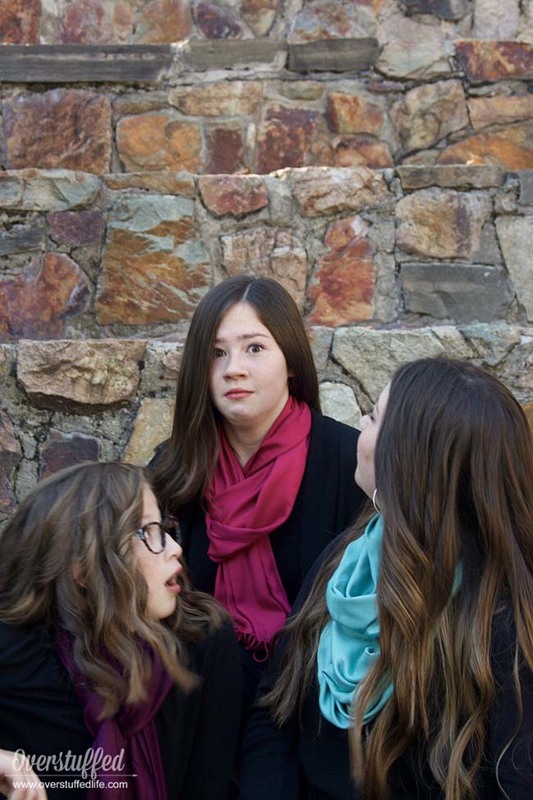 Family photos look best when everyone is closer than they think they should be. Of course we don't normally stand or sit practically on top of each other, but if you sit normally for a photo it will look like you're way too far apart! 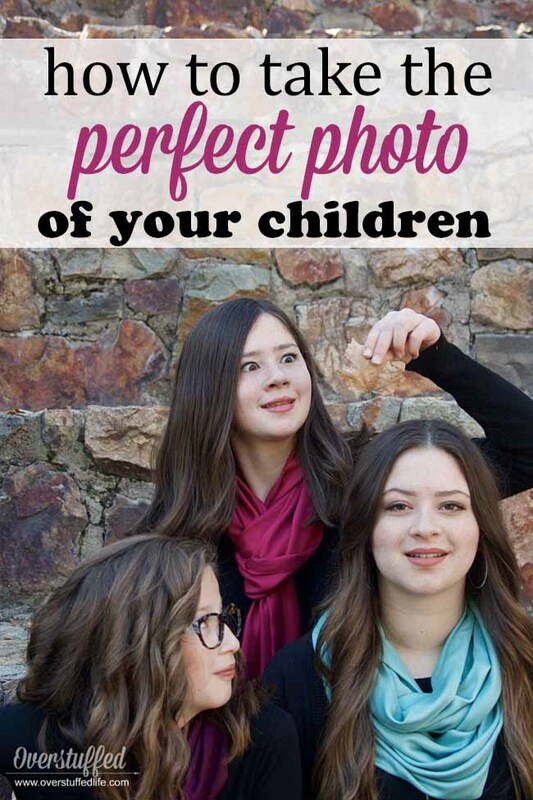 This tip depends somewhat on the pose, but as a general rule of thumb encourage your kids to cuddle up in photos. This is a hard one for my girls. My eldest hates being touched by anyone, so she can get a little grumpy about it. As long as I remind her in advance, she is usually good with it once we're shooting the photos. I encourage my girls to put their arms around each other, lay their heads on each other's shoulders, and make sure that they are touching each other at all times. "Act like you really, really love each other," is what I constantly say to them while we are taking photos! Of course they DO really love each other, but they are also normal siblings who don't want to let everyone know that fact! Our photoshoots never begin well. Perhaps it is just my kids, but they usually just plain don't want to be there. 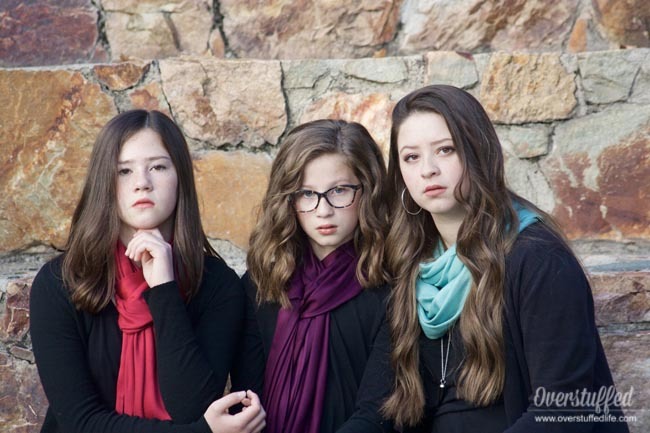 They are annoyed that I pulled them away from whatever it is they would rather be doing, they are not happy that they had to curl their hair and get dressed up, and I get a bit of attitude in the beginning. Thankfully my husband is my assistant when I am doing these photoshoots. He is the one who makes them laugh. Once he gets them laughing I start getting genuine smiles and relaxed poses and that's what I love in a photo. Sure, once they're laughing they are also inclined to start goofing off a little bit. But the goofy photos are still fun to have on hand and they keep the mood relaxed. I think that sometimes as parents we are too focused on getting that perfect photo and wanting our kids to smile and look at the camera and say cheese and sit still for the entire time. But that is just not realistic (especially if your kids are younger) so don't go into a photoshoot expecting that. Instead, go into the photoshoot expecting to have a lot of fun together. Don't worry if everyone isn't always looking at the camera or if someone is goofing off. 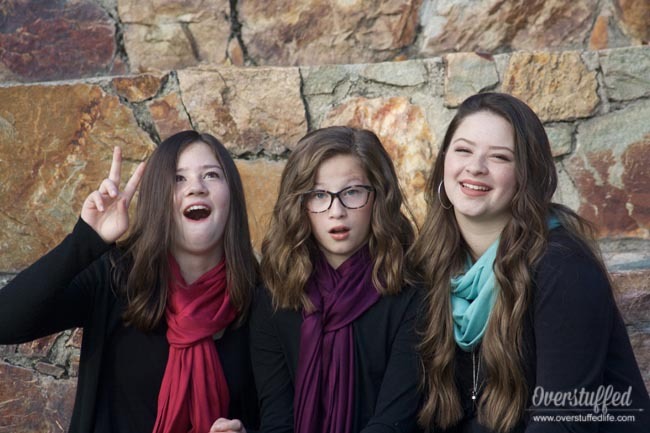 I have one child who always loves to goof off in the photos (and I'm sure you've already picked her out) but her silliness actually ends up making the photoshoot turn out even better in the end. 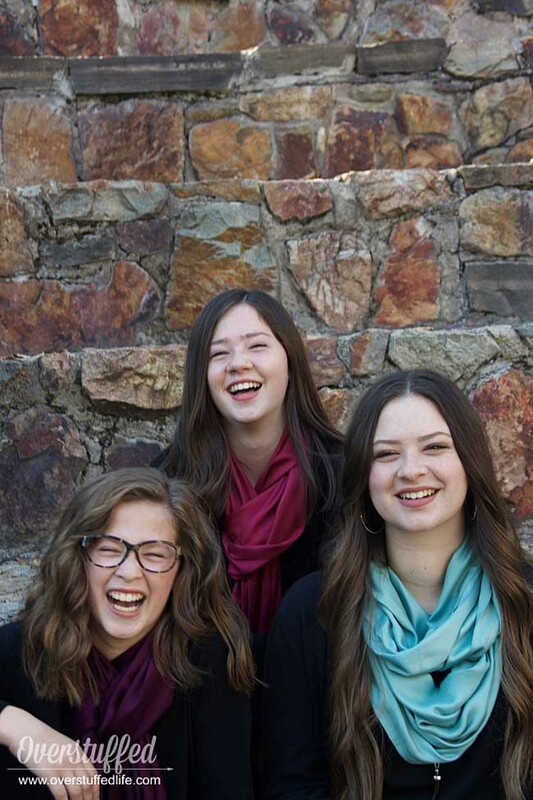 She gets her sisters relaxed and laughing, and that's way more important than having a few silly outtakes. The greatest thing about the digital age is that you don't have to worry about the cost of film and development anymore! Take hundreds of photos! I took almost 400 photos last week for our Christmas card photoshoot, and the vast majority of those went right in the recycle bin due to closed eyes, soft focus, or frowny faces. No worries, though, because I got more good ones than I needed, and several that I absolutely loved. This goes right along with making sure to laugh and have fun—it's important to make the photoshoot fun for them and that's your job. While having them sit there and smile can produce a good photo, give them some direction or activity to do and you'll get even better photos. Some ideas include having them pull silly faces, strike a serious "model" pose, jump in the air, look at each other, tickle each other, hug or kiss each other, climb a tree, or any number of things that pop into your head! Use your creativity and keep the photoshoot moving. Your kids will enjoy it so much more and the photos will be better because you did. My kids always complain at the beginning and then don't want to stop once we get going. It's awesome. Sure, there are lots of actual photography tips that will make your Christmas card better. Things like lighting and exposure and depth of field. If you don't know the more technical side of photography it's always good to study up, but these tips are what make your Christmas card the one that your friends look forward to seeing. In fact, with these tips, you'll get some great photos even if you just use your phone camera! If you're interested in seeing some of our photoshoots and cards from Christmases past, you can click on the links below. I enjoyed looking through these and seeing my kids grow up, my photography skills improve, and that some things never change—like the laughing shots are always my favorites.